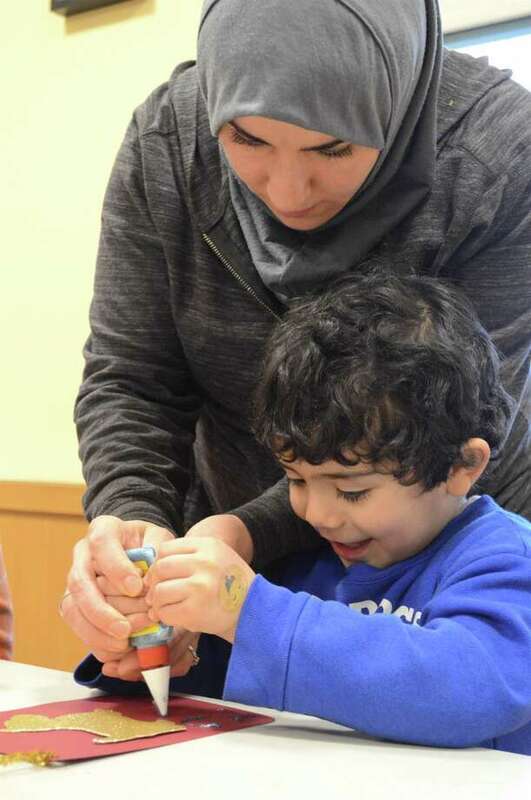 Alia Mahdi of Stamford helps her son, Musa, 3, at the Darien Library's Chinese New Year craft event on Friday, Feb. 16, 2018, in Darien, Conn.
DARIEN — The Year of the Dog arrived with a howl Friday afternoon when the Darien Library hosted a craft activity to celebrate Chinese New Year. “Today is the start of the Chinese New Year,” explained Samantha Cardone, children’s program coordinator, “so we are celebrating with a Year of the Dog craft. Kids constructed lanterns in the traditional colors of red and gold, decorating and coloring to their liking.